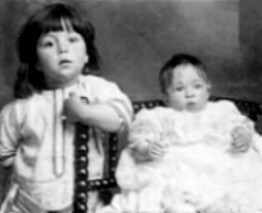 Millvina with brother, Bertram jr.. Titanic survivor Millvina Dean with her brother Bertram jr in 1912.. Wallpaper and background images in the R.M.S. Titanic club tagged: millvina dean titanic survivor rms titanic sea disasters vintage photo. This R.M.S. Titanic photo might contain damigella d'onore, ritratto, headshot, primo piano, and closeup. Just sooo beautiful and heart warming Cammie !